Well it’s been a crazy, stressful, awesome week all at the same time. We got a call from the assistants on Wednesday and my companion was transferred. ARE YOU KIDDING ME. 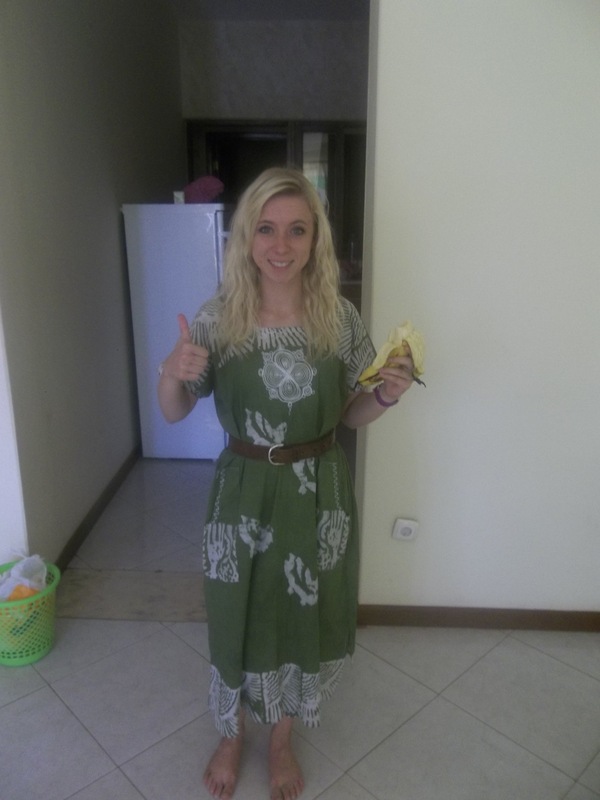 Apparently my old companion from Sao Vincente was still sick from that water we drank and she had to go home. So my comp here was transferred to Sao Vincente. I now have had 7 companions in my 4 months on the mission. That’s insane. To make it even better the companion I have now is waiting on her visa to go to Brazil so she’s never been to the MTC and I’m training her. It’s not bad though. 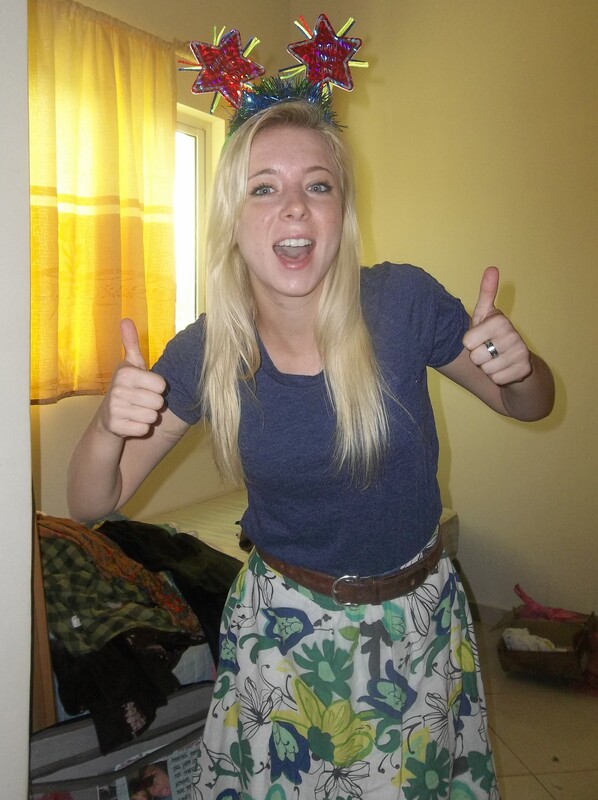 She served a mini mission and she already speaks portuguese so it’s a lot easier than training an American missionary. I’m just in charge of everything. Which is extremely stressful because I only have a few weeks in this area. Thankfully my new companion, Sister Cruz is super sweet and an awesome teacher. She’s also super beautiful and I look like an ogre next to her hahaha. Today we went to Suca Pira (giant market) and we found a really cool garden behind it where we ate delicious pastries and enjoyed the african greenery. This weekend was really awesome. We had two investigators baptized here in Monte Vermelho. Also! If you remember a few months ago I talked a lot about a couple we were helping to get married. They finally got married and baptized!! I didn’t get to go to the wedding which I was bummed about but I saw their baptism. Since it’s impossible to really remember everything in this ridiculously hot tiny internet shop Ill just write my journal entry. Yesterday was a crazy yet awesome day. I got to see Leo, Rosemery, Quianna, and Ima all get Baptized. David (my recent convert) spoke at the baptism and Mario (my other recent convert) baptized them. so cool! it often feels like I get nothing done in a day but then suddenly I see how many people have changed just because I showed up to their house and invited them to pray. They all look so happy. When Quianna saw me she ran up and gave me a big hug and told me about her wedding. I’m still bummed I missed it. Rosemery gave an awesome testimony after her baptism where she thanked all of the sisters who helped her through her hard times. We visited Leo’s family that night and he eagerly offered to give the opening prayer where he thanked Heavenly Father for his baptism and for how happy he felt now. So there you have it. Life is good! Hope youre all doing great too! The rainy season also happens to be the insect season. There are mosquitos, grasshoppers, and flies everywhere. Seriously. We taught a lesson last night and spent the whole time skillfully dodging flying grasshoppers. For some reason I did not know they fly. 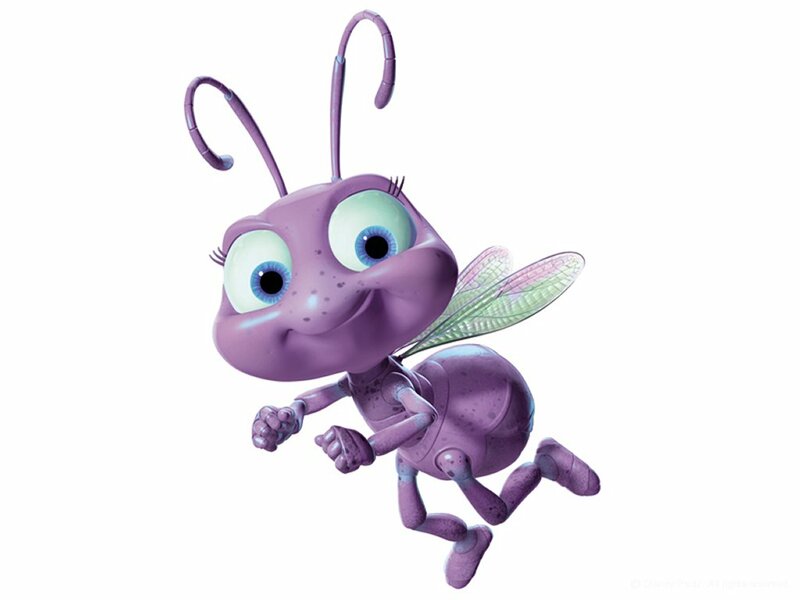 I should have learned that from watching A Bug’s Life but I didn’t. My comp was unable to dodge one and it went down the back of her shirt in the lesson. Bummer. Oh man, my house. MY. HOUSE. It is currently filled with flies and cockroaches. Cockroaches I can ignore. They mostly just hide in the dark places and I occasionally have to shoo some off the silverware in the drawers but ya know, that’s whatever. The flies though. Oh the flies. Everytime I turn on the sink a big puff of gnats comes out of the sink, making it very hard to wash my dishes. Plus they always fly in my ear when I’m trying to sleep! What’s up with that! RUDE. We came home one day and the house was filled with giant mutant flies and we spent like an hour running around killing them. Sister Pina killed the ones on the walls with a broom while screaming “VIDA ETERNO!” While I got the flies with a giant flattened box screaming “IS THERE NO ONE ELSE? !” It was intense to say the least. The other day we were hiking up a mountain to an investigator’s house (no big deal) and a huge wet dog ran up behind me at full speed and instead of going around me he decided to just run right through my legs. As if that isn’t a funny picture in and of itself, the dog was so big that I ended up like half riding the wet dog for a while until I threw myself off of it. Dogs here are crazy. So other than that crazy stuff the work here is great. We’re slowly building up our inventory of investigators and we should have two baptisms this Saturday. We had a family go to church on Sunday who had only had one lesson. Dedication! We’re also teaching a man who showed up to church on his own. He said he saw the sign in front of our church and just decided to go. Sweet! So yeah! Life here is good! I love and miss you all! Transfer week! So believe it or not I’m actually staying in this area. Maybe even for a whole transfer! wouldn’t that be something. I had a great week! We’re seeing a lot more success in our area and a lot of it has to do with obedience. The other day we wanted to take two investigators to see a baptism. One was 11 years-old and the other an adult. Well, the adult didn’t show up where we were supposed to meet and we were put in an unfortunate situation. We had this 11 year-old who was super excited to see a baptism but we couldn’t take a taxi with just him and it was too late to walk. We needed an adult because this is a mission rule. We considered just taking the taxi anyway because other missionaries have done it before but we decided to just be obedient and walked the discouraged 11 year-old back to his house. At his house we just so happened to find Brima, the other investigator we were going to go with! We hurried and took a taxi to the baptism that conveniently ran late and they got to see it. Afterwards they both said they wanted to be baptized! Had we not been obedient we wouldn’t have been able to take Brima to the baptism and we would have actually dropped him as an investigator because he wasn’t progressing before. Blessings of obedience! I had an awesome Birthday!!! I got a bunch of packages from mom which was awesome!!! We also went over to the other sisters house and had cake to celebrate. Mom sent me this awesome birthday hat. So anyway life here is awesome and I look forward to doing work in this area this transfer! 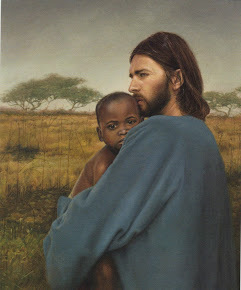 Mom Note: I found this beautiful picture of an African child with Christ by Liz Lemon Swindle at Deseret Books and sent it to Lindsay. She loved it. Dawn of the Rainy Season! todo bem!? This week went by really fast and I honestly don’t even remember very much about it. It was good though! Its been raining a lot cause it’s now the rainy season. I have found that here there are two types of rain. Theres the rain where it just pours like no other for hours and there the rain where its sunny out and randomly dumps a bunch of rain for like 5 minutes. The latter is horrible… for those of you that have seen Dragonheart I want you to recall the scene where the guy is fighting a dragon and ends up stuck in the dragon’s mouth…but the dragon can’t close his mouth because of the guy’s sword. So the guy is stuck in the dragon’s hot nasty wet mouth for hours. like. Then when it just pours for hours there’s really no point in an umbrella cause it rains so hard the rains just goes through the umbrella. It’s fun though! We forgot our umbrellas the other day and it just started pouring on us. It was a blast! we had to change our clothes afterwards haha. We’re teaching a barber and the only place we have to teach him is in his barber shop. The first time we taught him we were sitting in the dinky shop and there was another barber like 5 feet away shaving a man’s face. Hair flying everywhere and what not. In the middle of the lesson a vender came in and tried selling us sunglasses. We ignored him for a while then the other barber shaving a man’s face, without even looking up from the intense shaving session, goes -“Hey man… not now. We’re trying to hear the word of God.” – haha, were teaching him too now. Hope everyone has a great week! Tchau! I’m settled into my new area but it needs a lot of work. After the first few days I sat down with my comps and made a list of the investigators that were actually progressing cause I felt like none of them were. Of the twenty something that we had only 7 were actually progressing. That’s really bad haha. But we’re getting there. I’ll probably be transferred again before I can see any of the baptisms but we’ll see. I found something that was today that was like 3 weeks old. It was all rotten and wet and when I picked it up a huge swarm of gnats flew out and followed me with the trash. I found myself saying “OH NEPTUNE” like spongebob hahaha. I had divisions for a day last week in my old area which was weird. The other two sisters didn’t know the area so I was senior companion for a day. Stressful. I love my new comps! They crack me up. Plus I get to practice my portuguese all day. 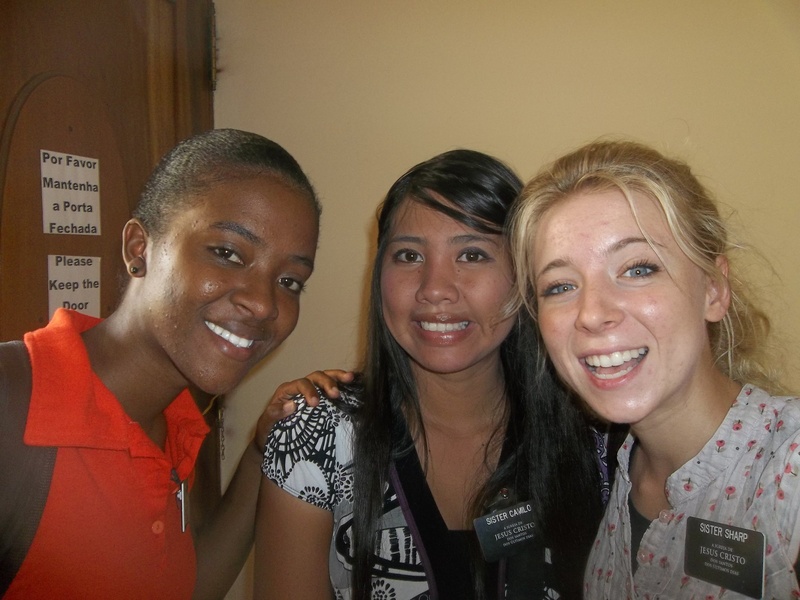 I’m teaching Sister Pina how to speak english and I’m teaching Sister Camilo how to say the th sound hahaha. good stuff. Just working hard and loving life. 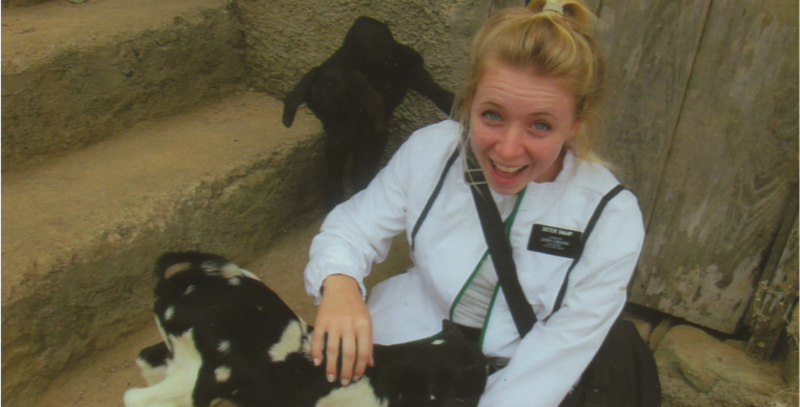 Missionary life rocks. I’m sooo glad I decided to go. It’s a lot of work but the sooner you decide to forget about the things that you want and ask for what Heavenly Father wants for you, the happier you’ll be. I’m pretty sure that goes for everyone, not just missionaries.